« The Adventure Continues Presents FIRENADO! Awesome Comedy by Andy Higson! A very pleasant day spent punting from St John’s College to The Doubletree – yes we did get to push our punt up the rollers – that was the best bit. We saw the EDL march and ignored it. Surrounded by police the you could really only see some England flags poking above the helmets and some hooligan like chants emitting from the walls of fluorescent yellow. It did give the city centre a horrid sort of feeling – like it was under attack. I think everyone in Cambridge was sort of embarrassed to have that sort of demonstration here. On Tuesday there was a public meeting and today a demonstration all against the EDL and what they stand for. The Big Weekend is on of course but I have to say I avoided it and sent Mum off to it instead. She seemed keen on the crowds of people and live music. Tim spent last night there and saw the fireworks which sounded fun. I spent the afternoon relaxing and creating something colourful with oil pastels. Last weekend I did the ‘Jackson Pollack’ I’ve been meaning to do for ages and I’m almost happy with it. 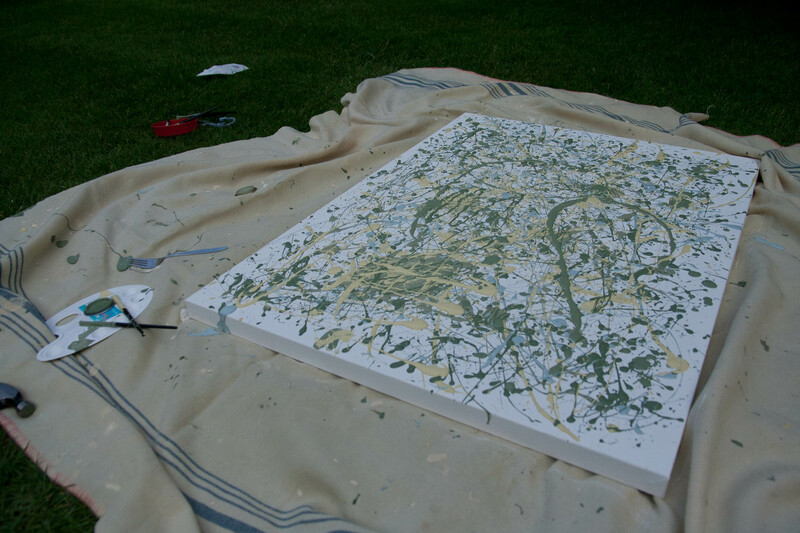 It was an amazing feeling splattering that paint on the canvas I can tell you! I plan to do as many of them as I can! Until I run out of money for canvases or my neighbours get fed up with paint on their clean washing! The evening saw the Free Inkers at the ADC in their first ever trip to the theatre. We went to see Alan Ayckbourn’s Improbable Fiction and what fun it was. We sat in the audience laughing and wearing pashminas and spent to interval eating ice cream and quaffing wine. We wanted to get the full theatre experience and we did. What fun! Tomorrow – yoga, garden party and with any luck Sunday Lunch! 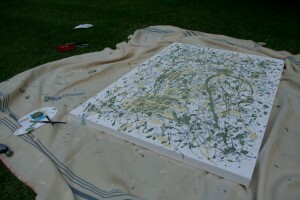 This entry was posted Sunday, July 10th, 2011 at 1:50 am	and is filed under Blog post, Things to do. You can leave a response, or trackback from your own site.